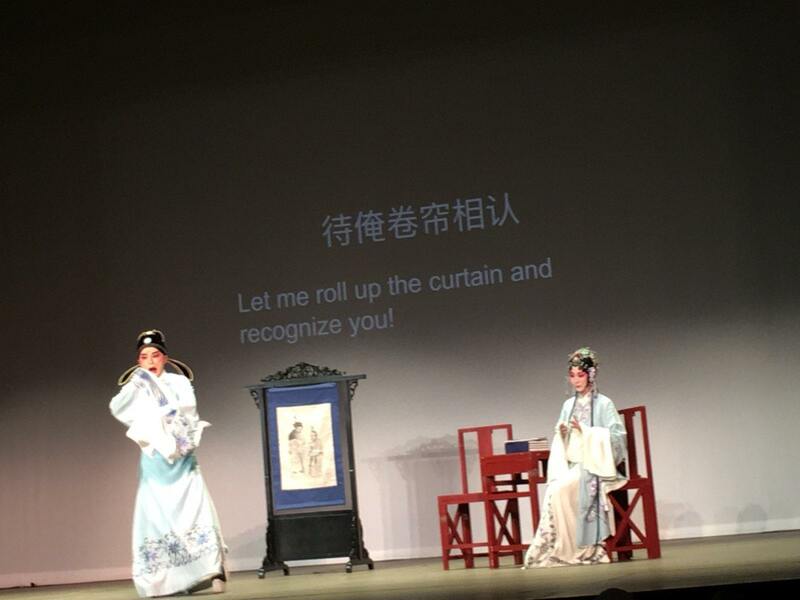 The grand finale of the Confucius Institute was the best show I have seen in all my four years at Michigan. 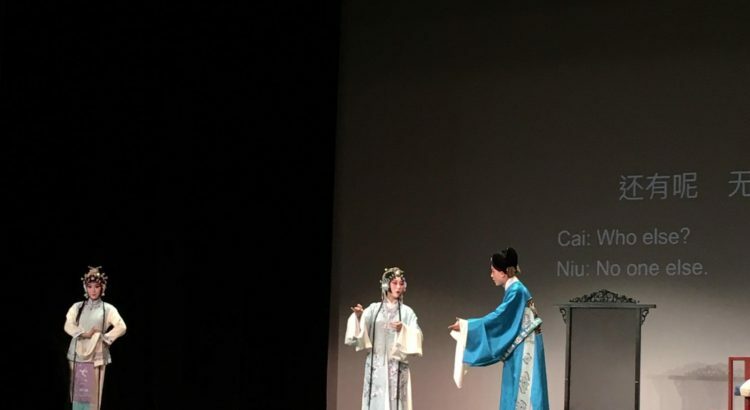 I appreciate the Confucius Institute for making my experience at U of M much more cultural and special, and congratulate them on all their success on U of M’s campus. 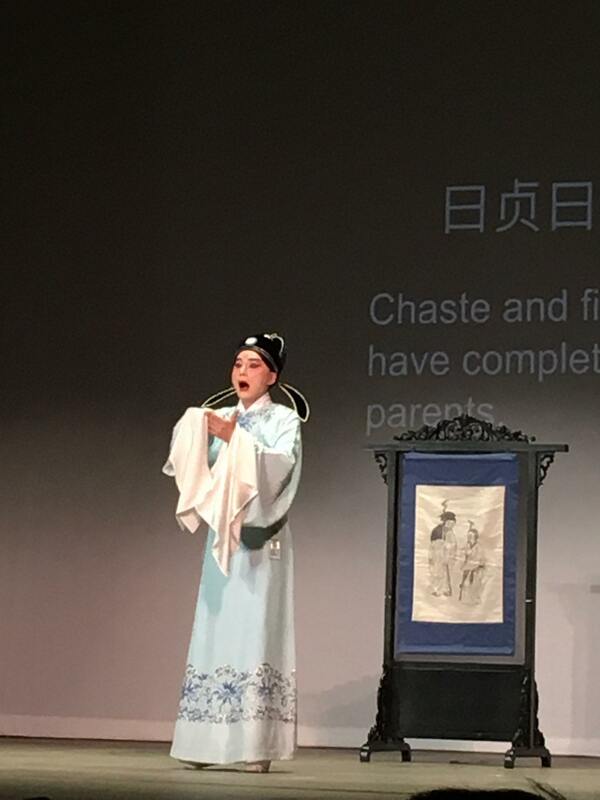 Chinese operas are more comprehensive than western operas because of the emphasis on movement and acting in addition to music and singing. These actors train their whole lives to be able to express subtle but deep emotions in their movements. I love how precise the movements align with the percussion and cymbals. Even when the actors were not moving they would stand in a beautiful pose flaunting their hands by elegantly contorting their fingers. Some other major differences between Western and Chinese opera include: Chinese opera has limited facial and mouth movements when actors sing, most of the singing from both male and female characters is an extremely high pitched falsetto, and the most important part of the clothing/costume is the sleeves. The costumes are extravagant. Dainty, light, silky, colorful dresses and robes combined with beautiful makeup and jewelry lining their hair. The male characters all had a feminine look to them because of the intense makeup and lack of facial hair. Still, sleeves are the most characteristic part of their clothes because of how the actors use their sleeves. Sleeves usually covering their hands would fly inward and outward with precision and control. The actors would twirl the sleeves occasionally allowing a glance at their fingers. The plot was extremely Chinese because it was all about filial piety. It was a depressing story about a failed son without a happy ending. Still, this play was surprisingly comical. Cai BoJie often had me laughing, especially when he interacted with Lady Niu. 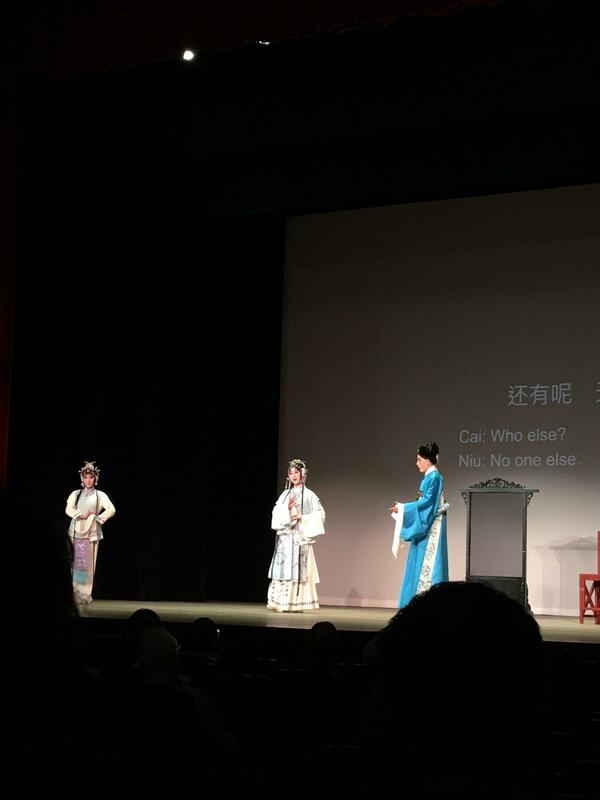 Besides the irony and intended comedy in their scene together, something about how respectful and orderly he was to Lady Niu was funny. Maybe it was the juxtaposition of his esteemed attitude and his melancholy feelings. Maybe it was how unnatural their relationship felt having to address each other as “honored lady/husband”. 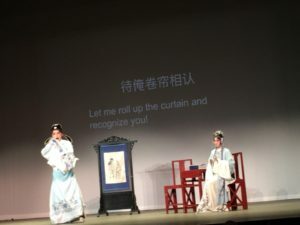 One thing for sure is that the movements in Chinese opera give a sense of comedy vacant in Western operas or American musicals because we don’t have to wait for a joke to laugh, the subtle movements of the actors do the work. The acting of the characters was truly incredible. Cai Bojie did a great job acting sorrowful and regretful. No matter what he was doing he always seemed conflicted. The scene where he was on his knees mourning his parents death was riveting. WuNiang was an incredible actress as well. Wuniang had a persistent look of worry the entire play. This showed the hardships she had been through and helped the audience understand the depth of her depression. The most comical character was the monk in the temple. He had a silly face and was constantly laughing. His singing sounded more like a fools chant than a monk reciting a prayer or sutra. I am curious if this was a commentary on monks? The monk seemed to care more about sucking up to Cai Bojie than actually performing rituals. Seeking money and donation must be his first priority. Music is a central component of the story. It is through music that characters displayed their true emotions. The most beautiful music was when WuNiang told her tale through the pipa. In fact, this play is named after the pipa, lute means pipa in English. My favorite sounds besides the instruments were when the actors would laugh or cry. My favorite scene was scene 3. 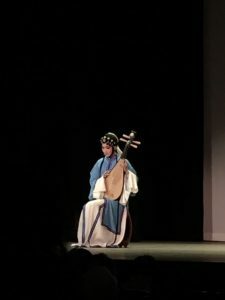 It was interesting that Lady Niu wanted to fervently punish Cai BaoJie when it was WuNiang who had to endure all the hardships because of Cai BaoJie. Yet, WuNiang didn’t want any vengeance on Cai BoJie and was willing to go back and mourn for another twelve years. The best part was when WuNiang revealed the name of Cai BoJie and she and Lady Niu simultaneously shrilled. All of a sudden they started to mimic each other, even slouching in the same manner. This was a once in a lifetime treat that I will never forget; being able to see a first-class Chinese opera, in the front row and with English subtitles. One of my regrets from High School was not seeing my school’s production of Sweeney Todd, but thanks to the department of musical theater I have been granted an opportunity to fulfill a past mistake. I am not a fan of anything scary, I have never seen a real horror movie because I can’t even make it through most commercials. I am making an exception for this show because I know it is going to be fantastic. 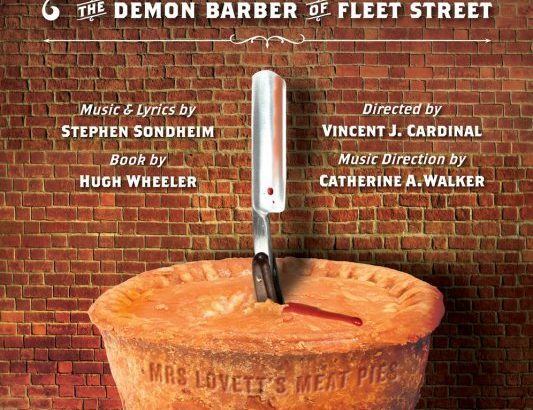 Sweeney Todd is about a barber who uses his barbershop to get revenge on the world. This musical has been on Broadway, won multiple awards including Tony awards, and has been critically acclaimed. You can see this show Thusday (4/18) at 7:30pm, Friday and Saturday (4/19-4/20) at 8pm or the Sunday matinee show at 2pm. 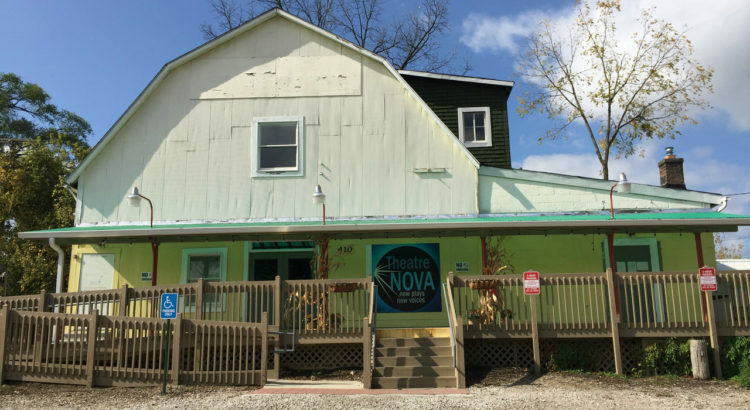 Theatre Nova is a cute little spot in Ann Arbor. It’s basically a house that has devoted the living room to being a theatre room. There are only around 30 seats in the audience, and the room is so small that I was able to sit three feet from the mainstage. The intimate environment and the ability to see the actors facial expressions and eyes so closely made the viewing experience really unique. This play was extremely well-written. It was ironic that I decided to see it with an expert in law, because I am an expert on The Beatles, and that is what this whole play was; John Lennon and a lawyer discussing how he is going to fight being deported and stay in the U.S. As a Beatles expert I was able to appreciate how accurately the writer portrayed John Lennon and captured John Lennon’s essence. This is difficult because John Lennon has an interesting personality; he is simultaneously laid-back and anxious. The author did a great job showing John Lennon’s humor while also showing his deep philosophical curiosity and capacity to be poetic. My friend confirmed that all the legal terminology was accurate and creatively put together. I assume the writer had legal expert help. I want to shake the writer’s hand for writing such a fantastic script. There were some great plot points that kept the play interesting and engaging. It was very comical having a lawyer who did not recognize John Lennon was or any of his music. This made for some great wordplay. I also enjoyed scenes that had characters looking directly into the audience, the great use vietnam war radio casts, and the historical accuracy of the play, even with the small details. The dynamic relationship between the lawyer, who was a total square, and John Lennon was fantastic. Not only did they become close friends, but they were also able to teach each other. The lawyer taught John the importance of being a family man and John showed the square that the government is not infallible and righteous. I also learned a lot as an audience member. Historically war has been sold like a product. John Lennon wanted to sell peace like a product. Conservatives and radicals are evolutionarily advantageous for the human race. The constant struggle between those trying to change things and those afraid of change is somehow what moves us forward as a whole. Actions can be significant from intangible actions. Changing the world can be done in intangible steps. Woodstock was amazing just because it happened, it doesn’t matter what tangible actions happened afterwards. The end of the play had the most emotional scene as the square lawyer, for the first time, lost his temper. He ranted in a state of befuddlement and fury how disgusting it was for the U.S. to use immigration law as a political pawn. This is the world premiere of the show and you can see it this Thursday thru Saturday (4/11-4/13) at 8pm or on Sunday (4/14) at 2pm. Beware, the last showing is April 14th, so this is your last week to see the show. The show is taking place at Theatre Nova which is a local Ann Arbor establishment located at 410 W. Huron, Ann Arbor. You can buy tickets in advance for $22, or if you show up right before the play you can purchase a last-second-pay-what-you-want ticket, which is great for anyone trying to save money. This show takes place during the Vietnam war when the U.S. tried to deport John Lennon over marijuana possession. It is a play that will contrast relaxed, witty, chill personalities with hardline, uptight, angry personalities. This is the description from Theater Nova’s website: January 1972: Vietnam war protests are at their peak, and newly ex-Beatled John Lennon walks into the office of Leon Wildes, an eminent immigration lawyer. 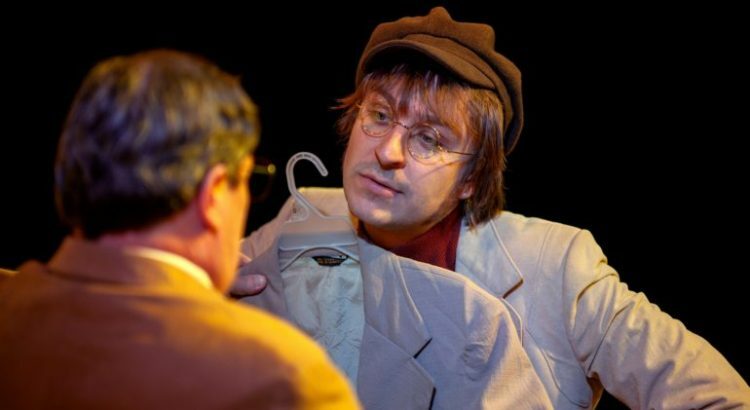 As ultra-laid-back Lennon and straight-laced Wildes navigate Lennon’s stormy immigration case, an unlikely and comical kinship unfolds, and both men gain a greater understanding of friendship, personal values, and patriotism. Based on the true story of the Nixon administration’s attempt to deport John Lennon. If you’re a Beatles fan, this show is a must see. This was a very experimental play, but Shakespeare plays are so commonly performed that any rendition not beyond experimental or without a famous actor in it won’t get recognition. At first, I was confused by the modern setting, it felt weird hearing about Rome and an emperor from a bunch of guys in suits and joggers, but I quickly got used too it and actually liked the modern relevant feel this play had. The first interesting plot point to contemplate is whether Brutus should betray his best friend, Julius Caesar, by joining the Senate conspiracy to kill him. It is an interesting dilemma because I think it is heroic to turn on someone you love for what you believe is the best for the general good of your country. This is why Brutus decides to kill Caesar, he believes this is the best solution to maintain the freedom of Rome, there wasn’t any selfish reason attached. However, Brutus is portrayed as the antagonist of the play for killing Caesar. From the play, we don’t know whether Caesar was a good or bad person, and therefore there is no plot that suggests killing him is any worse than not killing him. Still, the stabbing of Caesar is portrayed in such a gruesome and murderous scene, that the moral I took is that murder is never acceptable in any circumstance. The most important aspect was the lighting. The settings were built so that the feeling could be easily manipulated by the lights, for example, the opening scene had all of the characters standing in front of giant white blocks. The only colors in the whole play were white, black and red. This little color variance made the tone of the color that was set by the lights more prominent. The lighting was often extremely bright or dark to contrast the different emotions and thoughts of the characters. When characters were in disagreement or friction, they would be portrayed with a different level of brightness. As soon as characters started to agree with each other, all of a suddenly the lighting on them would match as well. The radiant lighting made the play feel factioned and it made events feel more intense. Bad events felt evil, courageous events felt heroic, and gloomy moments felt hopeless and depressing. Lights were even used to cast the audience as part of the play. All the lights in the theater would turn on, so even the back rows were completely lit when the audience would be portrayed as the roman mass of citizens. Brutus and Marc Anthony speaking at Caesar’s funeral are the two best monologues I have ever heard. I was previously familiar with snippets of these speeches, but I have never heard them in their entirety or seen them performed. Brutus’s rhetoric is all based on ethos and logos, it is extremely logical and he is an honorable man considering he is on the Senate. Marc Anthony speaks with all pathos, contemplating on why he loved Caesar, and it is Marc Anthony’s speech that sways the crowd and starts the civil war. This is so true of life, emotional appeal trumps everything during a speech or debate. Julius Caesar is the best example of why Shakespeare needs to be performed instead of read. When the characters speak, the syllable emphasis is extremely important. During a dialogue, how the actor stresses “sh” sounds or “t” sounds can make him sound conniving or sympathetic. Cassius was my favorite character mainly because of how great a job he did speaking. He spoke with clarity, like a voice of reason, and had such strong pronunciation and emphases when he spoke that I knew he was a persuasive character who would be able to sway Brutus, who was a lot gentler in his pronunciation and speech. Cassius also had a great straight face throughout the play, he was serious and never smiling. Brutus was a lot more emotional, and his movements would vary from comical to melodramatic. This suprised me, I never imagined Brutus being portrayed in such a weak and malleable manner. It took some of the dignity out of Brutus, which is a necessary trait for Brutus to have to justify the killing of Caesar. Lucius was by far the most experimental character in this rendition of Julius Caesar. Most of the time he wasn’t a plot character interacting with the rest of the characters. Instead, he would interact with the other characters in a mysterious and surreal way. It was like he represented the thoughts and conscience of other characters. He would stand next to the other characters while they were talking, mimicking them with interpretive movements. He spoke no words only performing interpretive dances. Lucius would break out of the plays dimensions to foretell what will happen or to tell what is really happening with his movements. My favorite dance of his was when he acted out Caesars stabbing before it happened. I liked the subtle touches of this play. The circular language in Julius Caesar is very apparent and this play would add a comical emphasis when reciting these lines. There was often a confusing mixture of “I and you” “here and there” “With and without” and the actors would looked confused when speaking them. 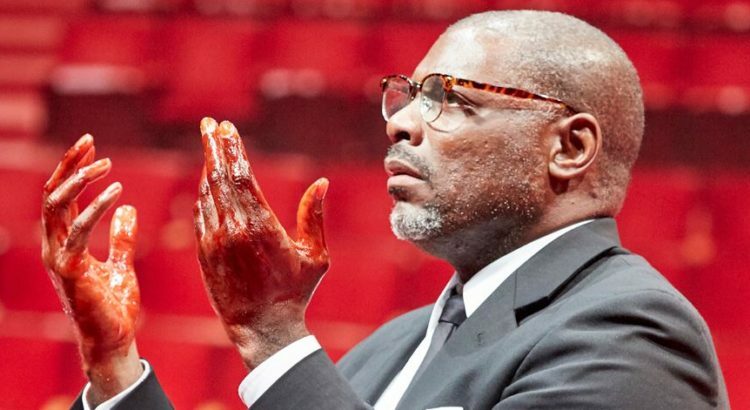 Shakespeare loves having blood on characters hands, this play had no shortage of blood on hands and arms. They also incorporated the mysterious babushka lady (look her up), which was very fitting for this play. My favorite touch was the Jazz Trio, who would provide little breaks throughout the play for our minds to rest and relax. What I have learned about slam poetry at U of M is that slam poetry is one of those things everyone goes “ah that is so cool” too, but don’t care to participate in or view. The people that like slam poetry, love it, because it consumes their emotions and creativity. Slammers can’t get enough slamming. They perform and watch others perform. If you don’t slam you don’t care to watch others perform. It isn’t like improv comedy, where everyone goes to see the shows whether they perform improv or not. This is an important lesson to learn because Rackham yesterday was mis-booked. Rackham is a big beautiful auditorium, but it feels daunting when only 20 people show up for the slam leaving the auditorium empty. At least Kai made a great decision forcing everyone to come to the first few rows to make the vast space feel smaller. Kai’s poems were absolutely phenomenal, I feel like she is ready to get some viral recordings on button poetry. Her first poem creatively used ghosts to symbolize depression, what is wrong with hypocrisy and culture in America, and how these issues have affected herself and her family. I liked Kai’s use of sheet white faces, rituals, exorcism and I liked how I could never tell who Kai was addressing this poem to, whether it was to herself, America, or her parents? I liked the quote “Depression in America is laziness in Asia, and not a disease but a ghost to her father.” Her second poem was also great, I liked the imagery of mechanical humans and her repeated use of three questions. Roya’s poems were all extremely passionate. She showed how important it is to memorize your poems because then poems can come from the heart instead of a sheet of paper. She also cusses a lot in her poems she even had a whole poem about certain curse words. 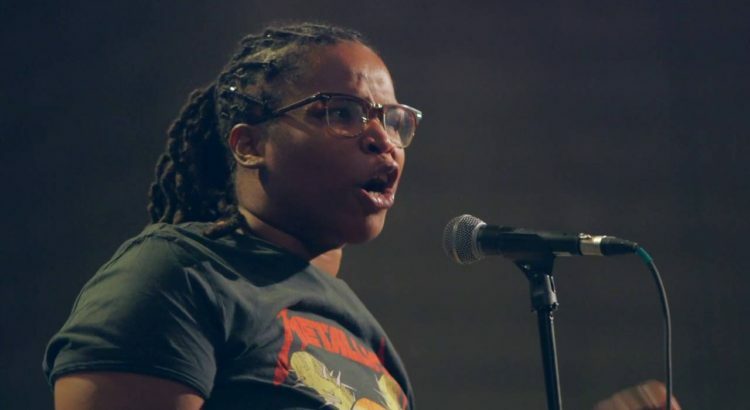 Cussing in slam poetry is like a right of passage, only great poets can use cuss and not have everyone in audience flinch. Roya said if you’re going to put a curse word in your poem, it should be the strongest word in the poem, otherwise, don’t use it.